10 Signs You are probably spoiling your dog and I must confess, I have to lay claim to a couple of these myself. 1. You think begging for table scraps is beneath him so you let your dog eat at the table with you. 4. You bought matching His and hers place mats for your dog and yourself. 5. At dinner parties you always double check the butter for visible lick marks before putting it on the table. 7. 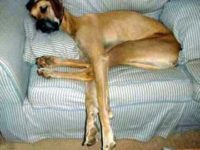 You don’t care if you or your spouse is comfortable at night just as long as the dog has enough room on the bed. 8. You complain about the rising cost of groceries but you don’t think twice about spending a fortune on doggie treats. 9. Your dog always gets the best spot on the couch. 10. He has his own website. This was found at http://fortheloveofthedogblog.com by Deanna Raeke who is a canine advocate. She has a wonderful doggie blog and is doing what she can to help our furry friends everywhere. No one tell Carol, but I think her dog might be spoiled. Check out http://www.mydogbert.com if you don’t believe me. .-= Cenay Nailor´s last blog ..Fix The WordPress Blank Page Error =-.